Receive an entire year of table topper projects from Patrick Lose! 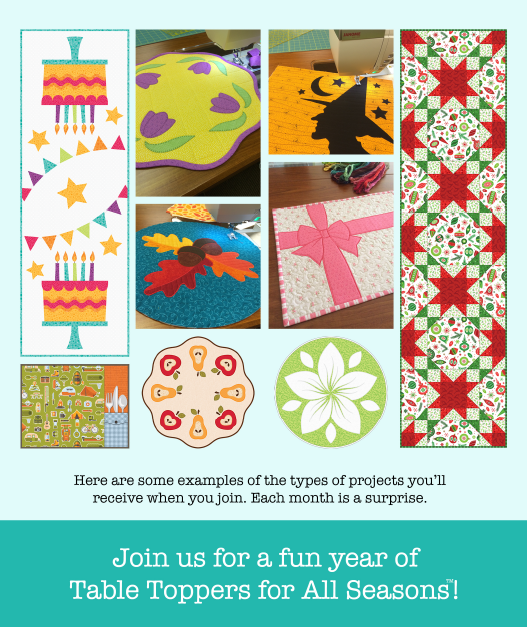 Each month you'll receive, from Patrick Lose directly via email, a member packet which includes a project for the month with simple, easy-to-follow instructions and/or diagrams to create placemats, table toppers or centerpiece mats designed by Patrick. At months 6 and 12, you will also receive a BONUS quilt pattern, designed by Patrick, a $24.00 value.. When available, machine embroidery files will also be included. SVG files for appliques will also be provided, for those who use digital cutters. The first project will be delivered September 15 and all subsequent projects will be delivered mid-month. Additionally, for customers wishing to attend, we will be offerring a free lecture/demo in Wilmington, monthly, featuring one project each month. Please note:� Late registrations will receive all projects from September 2017 up until their registration month.� Projects cannot be prorated for a partial year.